We may be writers, but we’re also professional marketers with several successful businesses under our belts, including one of the TOP mental health practices in the country. You’re too smart to think that Google rankings and Facebook Likes are enough. You don’t want clicks… You want clients. You’re looking for a return on your marketing investments. At the Therapy Marketing Institute you’ll get all of the help and data-driven strategies, tactics, and action plans you can take straight to the bank. Benefits vs. Features, and Niches, Oh My! What’s Your Unique Marketing Message? We publish information like this every month. Multiple times a month. 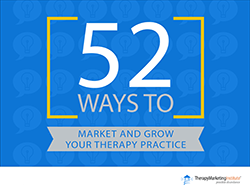 Join hundreds of Therapy Marketing Institute subscribers and get fresh content delivered directly to your email inbox.